Nabertherm is a German based manufacturer of high temperature furnaces since 1947. The high temperature furnaces are used for various applications like sintering of ceramics, melting of metals or glass, annealing, testing of different materials. 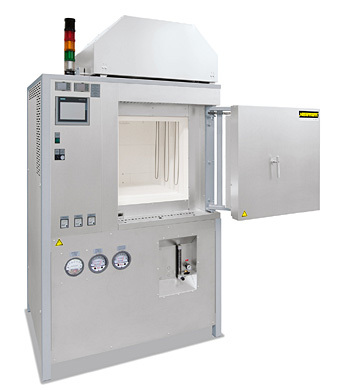 With solutions for laboratories, universities, R&D departments and also as large production furnaces Nabertherm covers the complete range of high temperature furnaces. The smallest furnace has a volume of one liter and a Tmax 1500°C. The engineering team of more than 40 engineers is able to design also customized solutions e.g. in special dimensions or controlled atmospheres or even with vacuum. High temperature furnaces can be manufactured up to a volume of more than 1000 liters. A multi-level safety system ensures a safe operation of the high temperature furnace every time. The furnaces are available as bench top versions, standard chamber furnaces, bogie hearth furnaces or as hood type furnaces. Intuitive control systems provide for a simple and safe operation of each furnace. Nabertherm offers furnaces for powder technology, metal injection molding (MIM), ceramic injection molding (CIM), bio ceramics, fuel cells, photovoltaic or thermal treatment of wafers under clean room atmosphere.